Archaeologists say that there is evidence of human habitation in the Kerrville area as far back as 10,000 years ago. None of those people left any recorded history though, so most records begin with the European settlement of the area began in the 1840s. That’s a few years after Sam Houston surprised and defeated Santa Anna at the battle of San Jancinto in 1836 and won Texas independence from Mexico. Every Texan knows about this battle. Kerrville grew steadily, pausing during the Civil War but prospering during Reconstruction. 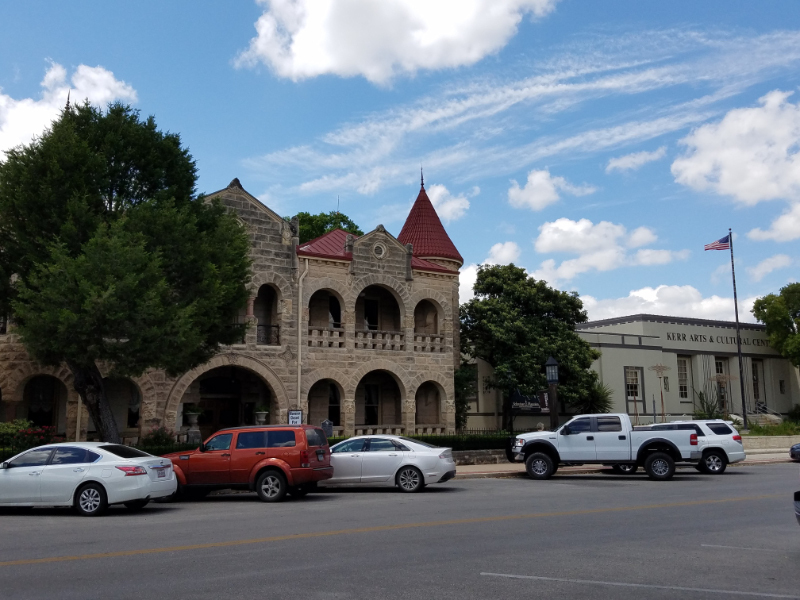 Charles Schreiner Sr., a former Texas Ranger, was instrumental in the early growth of Kerrville and later became known as the “father of hill country.” His mansion – located old downtown Kerrville – is now the Hill County Museum. Unfortunately the mansion/museum is undergoing refurbishment and renovations which mean it is closed for tours until the work is completed so we didn’t get to go inside. Shreiner built the forerunner of the first department store which he called – wait for it – “Shreiners.” Many long nights and many marketing consultants were involved in the determination of that name, I’m sure. Shreiner’s had an amazing run, being acquired by Duncan’s in 1991 and only closing in 2007 after an incredible 138 years! 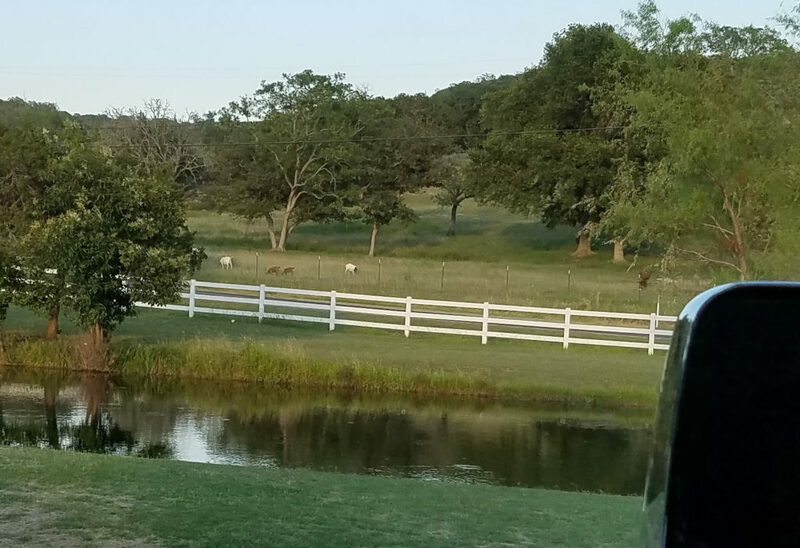 Cattle-sheep-goat ranching, light manufacturing, and other diversified business helped Kerrville continue to prosper in the 1900s. It also explains the goats across from our MoHo, by the way. 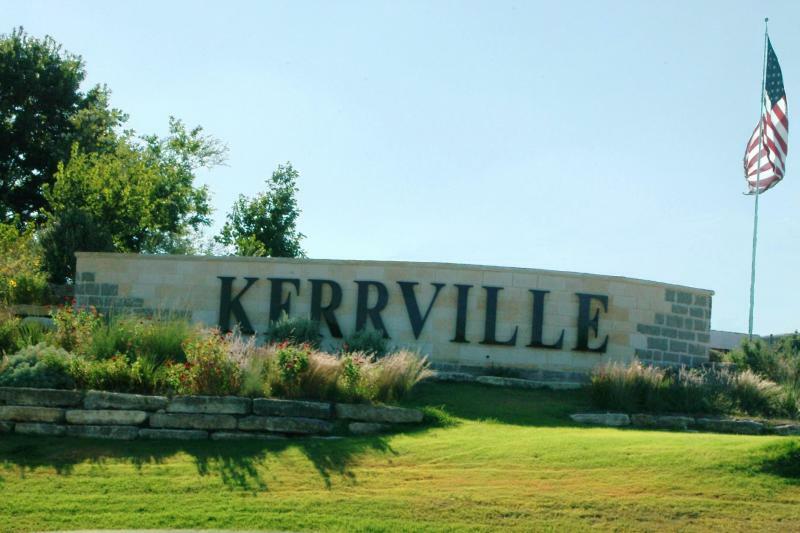 By the 1990s, the Wall St. Journal listed Kerrville as one of America’s wealthiest small towns. 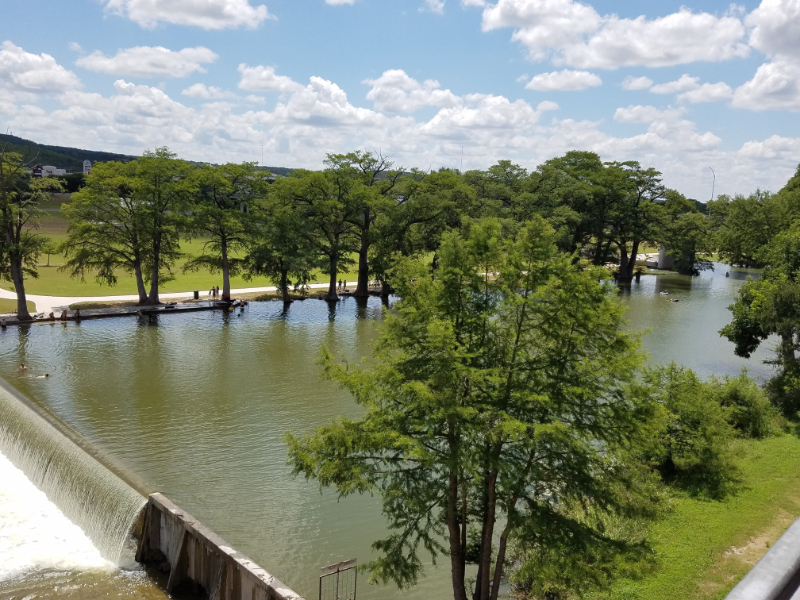 Today, Kerrville is a bustling small town of around 23,000 people with another 20,000 or so in the outlying areas. 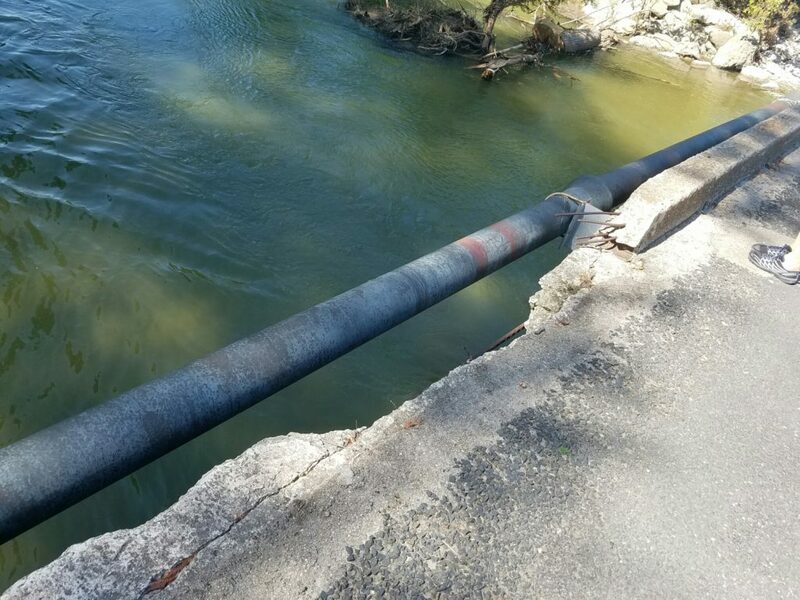 The Guadalupe River goes right through the middle of Kerrville. 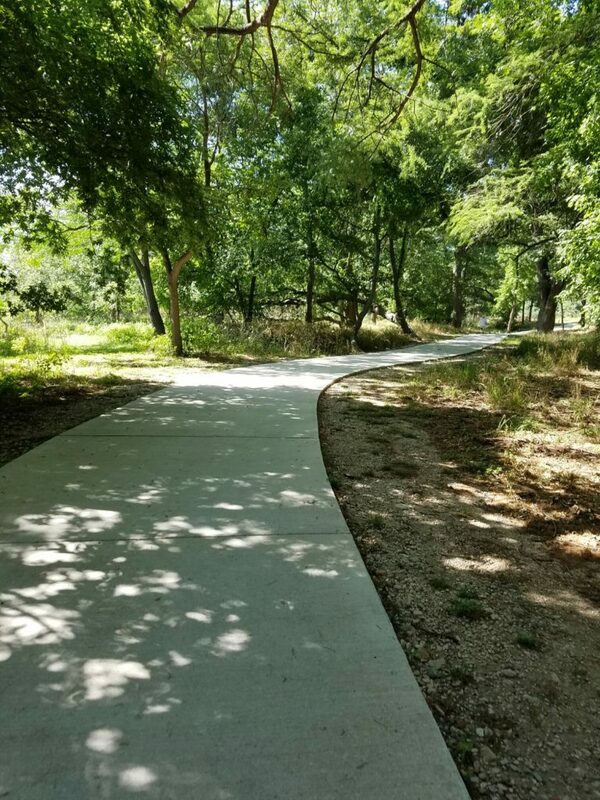 One of the highlights of Kerrville is the walking path along the Guadalupe river. It goes for miles and is extremely well maintained and quite scenic. Some parts of the path connect to older roads and even old bridges across the river. This part of the path went across an old bridge that clearly has seen better days. 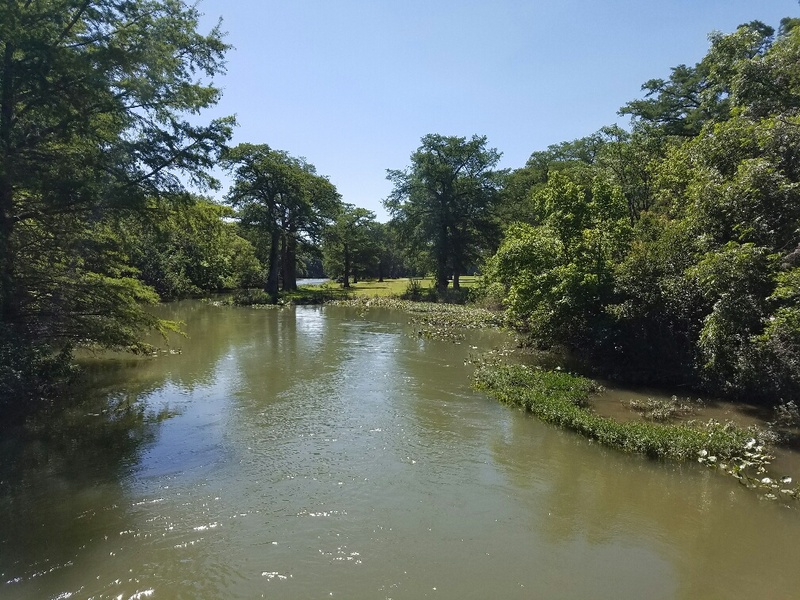 It is a very peaceful walk along the river, mostly in the shade of huge cypress trees. Ducks and geese sit quietly on the bank or in the water. Lilypads grow in the quiet areas of the stream. Frogs and turtles bask in the sun. 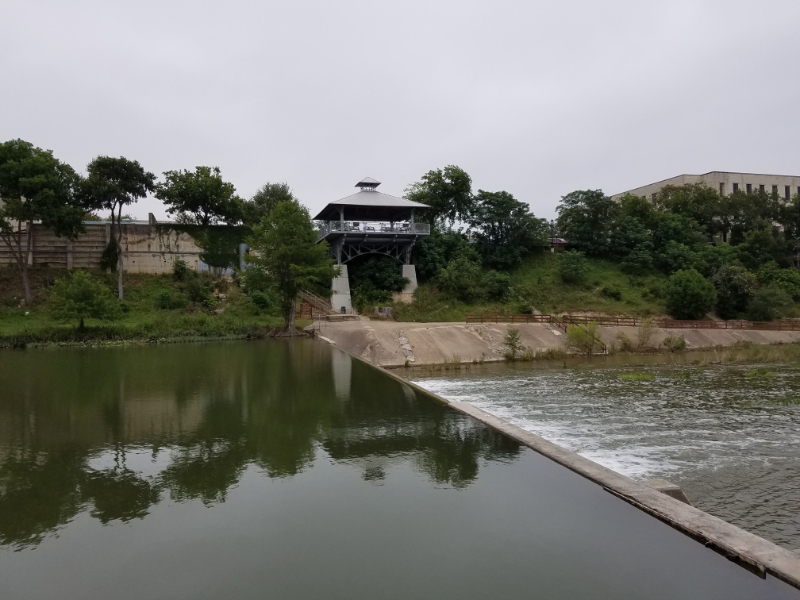 A highlight is ponding lake, a manmade swimming hole right next to downtown where people swim, fish, kayak, and otherwise enjoy the water. Quite a few people were enjoying the water when we were there! The ponding lake area is in Louise Hays park. There was a nice observation platform built on the Kerrville side at the center of downtown. Many buildings are constructed from local limestone blocks still quarried in the area. The result is a very attractive and clean look that is still quite popular. Even new construction often uses this stone. I have always been a fan of stone buildings so this pleases me to no end. 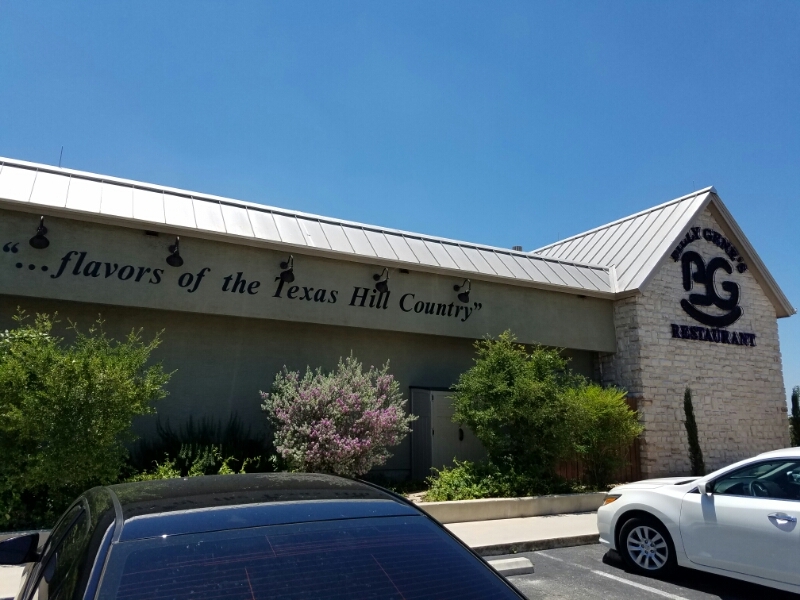 Kerrville offers a number of restaurants with down home Hill Country cooking like chicken fried chicken, fried catfish, and fired okra. That’s a lot of “fried.” TexMex is big here too. One of our favorite places is Billie Gene’s. They have great food at reasonable prices combined with a killer view on the back patio. 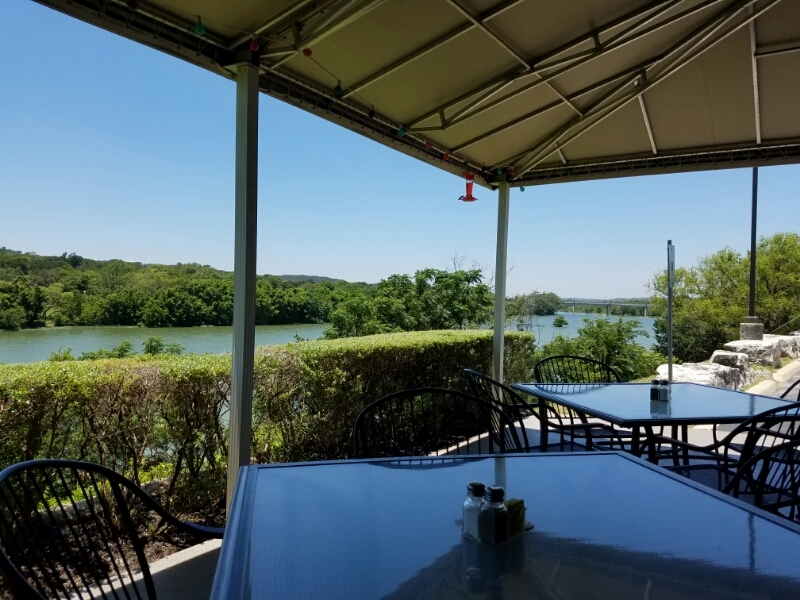 Nothing beats sipping a cold iced tea while sitting on the patio looking out over the river! There is quite a lot of local wildlife here as well. We returned one night to the MoHo and saw a huge turtle walking on the concrete spillway between two ponds. The spillway isn’t smooth like a slide, it is a mini-waterfall, with several 2 feet drops. Suddenly, we saw the turtle go off the edge. I wouldn’t have thought much about it, but Heather wanted to go see the turtle. 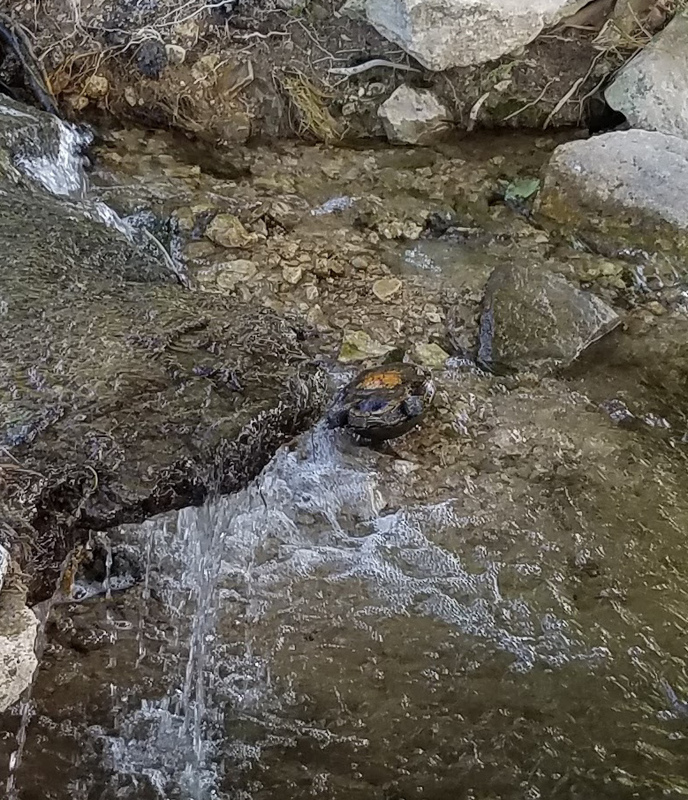 When we got to the spillway, Heather spotted the turtle and he had fallen exactly on his back and wedged between some rocks at the base of the spillway!! That little dude was not going anywhere without some help! I climbed down and used a stick to tip him back over and into the water. He was heavy – it felt like tipping a cantaloupe! He seemed none the worse for wear, and the next day he was gone. I don’t know how long he would have been stuck there if Heather had not insisted we go see him, but it likely would have been a LONG time. 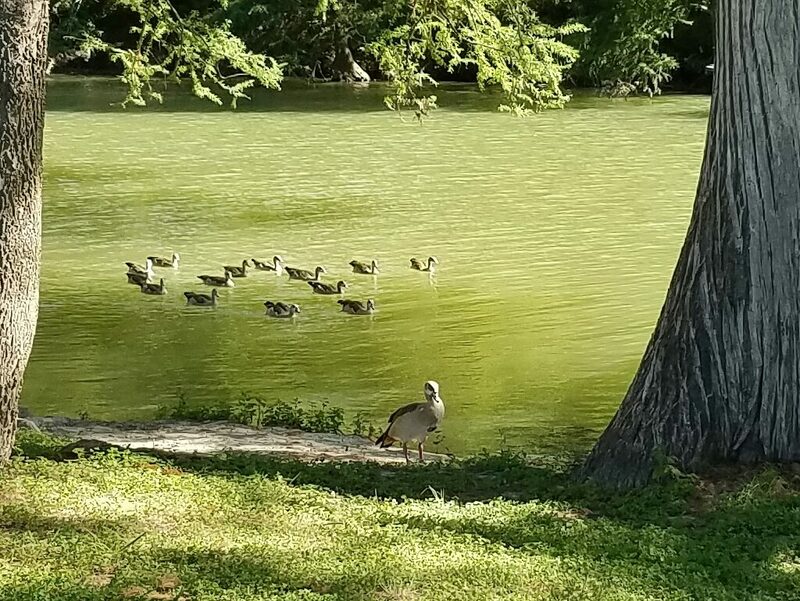 In spite of there not being a lot of “tourist” things to do in Kerrville, its been one of our favorite areas! Very relaxing, killer parks, super friendly people, nice scenery, good weather, and just a great place to be. We both remarked that Kerrville seems like a vacation from our vacation!